Treat yourself to an indulgent brunch to make up for losing a precious hour in bed! 1. Whisk the Yeogurt, lemon zest, egg yolks and butter together. Leave for 10 mins. 2. Sift in the flour and a pinch of salt and whisk. 3. In a clean bowl, whisk the egg whites until stiff, then combine a third with the batter mixture. Then, using a metal spoon, fold in the rest of the egg white along with the raspberries. 4. Melt a little butter in a large frying pan and add spoonfuls of batter. Cook for 1-2 mins, flip and cook for a further 1- 2 mins. You should have about 16 small pancakes in all. 5. 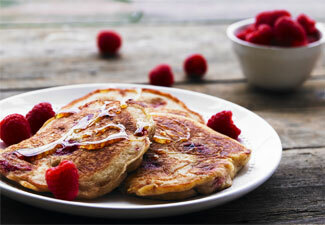 Sprinkle with fresh raspberries, drizzle with clear honey if you fancy it and tuck in! Fancy another berry fix? Give our Blueberry pancake recipe a whirl.